In my current project, I've been helping a client develop a native iOS app for their customers. It's written mostly in Objective-C and talks to a REST API. I talked about how we documented our REST API a couple days ago. We developed a prototype for this application back in December, using AngularJS and Bootstrap. Rather than using PhoneGap, we loaded our app in a UIWebView. The prototype used Bootstrap heavily, but we quickly learned it didn't look like an iOS 7 app, which is what our UX Designer requested. A co-worker pointed out Ionic, developed by Drifty. It's basically Bootstrap for Native, so the apps you develop look and behave like a mobile application. Free and open source, Ionic offers a library of mobile-optimized HTML, CSS and JS components for building highly interactive apps. Built with Sass and optimized for AngularJS. I started developing with Ionic a few weeks ago. Using its CSS classes and AngularJS directives, I was able to create several new screens in a matter of days. Most of the time, I was learning new things: how to override its back button behavior (to launch back into the native app), how to configure routes with ui-router, and how to make the $ionicLoading service look native. 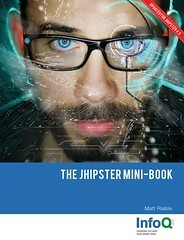 Now that I know a lot of the basics, I feel like I can really crank out some code. 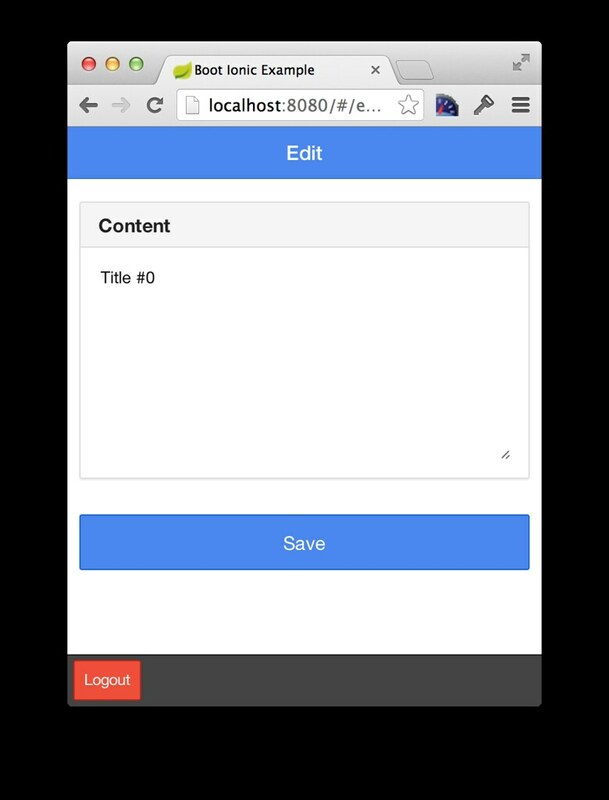 Tip: I learned how subviews work with ui-router thanks to a YouTube video of Tim Kindberg on Angular UI-Router. However, subviews never fully made sense until I saw Jared Bell's diagram. To demonstrate how easy it is to use Ionic, I whipped up a quick example application. 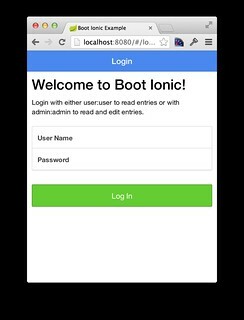 You can get the source on GitHub at https://github.com/mraible/boot-ionic. The app is a refactored version of Josh Long's x-auth-security that uses Ionic instead of raw AngularJS and Bootstrap. To keep things simple, I did not develop the native app that wraps the HTML. Below are the steps I used to convert from AngularJS + Bootstrap to Ionic. If you want to convert a simple AngularJS app to use Ionic, hopefully this will help. 1. Download Ionic and add it to your project. Ionic 1.0 Beta was released earlier this week. You can download it from here. Add its files to your project. In this example, I added them to src/main/resources/public. In my index.html, I removed Bootstrap's CSS and replaced it with Ionic's. You might ask - why not use WebJars? You can, once this pull request is accepted and an updated version is deployed to Maven central. Here's how the application would change. 2. Change from Angular's Router to ui-router. Ionic uses ui-router for matching URLs and loading particular pages. The raw Angular routing looks pretty similar to how it does with ui-router, except it uses a $stateProvider service instead of $routeProvider. You'll notice I also added 'ionic' as a dependency. 3. 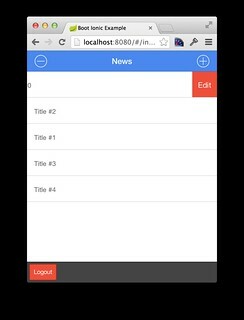 Add Ionic elements to your index.html. In contrast to Bootstrap's navbar, Ionic has header and footer elements. Rather than using a ng-view directive, you use an <ion-nav-view>. It's a pretty slick setup once you understand it, especially since they allow you to easily override back-button behavior and nav buttons. 4. Change your templates to use <ion-view> and <ion-content>. After routes are migrated and basic navigation is working, you'll need to modify your templates to use <ion-view> and <ion-content>. Here's a diff from the most complicated page in the app. +                <button class="button button-icon icon ion-ios7-minus-outline"
+            <a href="#/create" class="button button-icon icon ion-ios7-plus-outline"
After making all these changes, the app looks pretty good in Chrome. In additional to figuring out how to use Ionic, I discovered a few other tidbits along the way. First of all, we had a different default color for the header. Since Ionic uses generic color names (e.g. light, stable, positive, calm), I found it easy to change the default value for "positive" and then continue to use their class names. To modify the base color for "positive", I cloned the source, and modified scss/_variables.scss. After making this change, I ran "grunt" and copied dist/css/ionic.css into our project. Our app uses a similar token-based authentication mechanism as x-auth-security, except its backed by Crowd. However, since users won't be logging directly into the Ionic app, we added the "else" clause in app.js to allow a token to be passed in via URL. We also allowed the backend API path to be overridden. We also had to write some logic to navigate back to the native app. We used a custom URL scheme to do this, and the Ionic app simply called it. To override the default back button, I added an "ng-controller" attribute to <ion-nav-bar> and added a custom back button. Our Ionic app has three entry points, defined by "stateName1", "stateName2" and "stateName3" in this example. The code for our NavController handles navigating back normally (when in a browser) or back to the native app. The "appName" reference below is a 3-letter acronym we used for our app. You can find the source from this article in my boot-ionic project. Clone it and run "mvn spring-boot:run", then open http://localhost:8080. 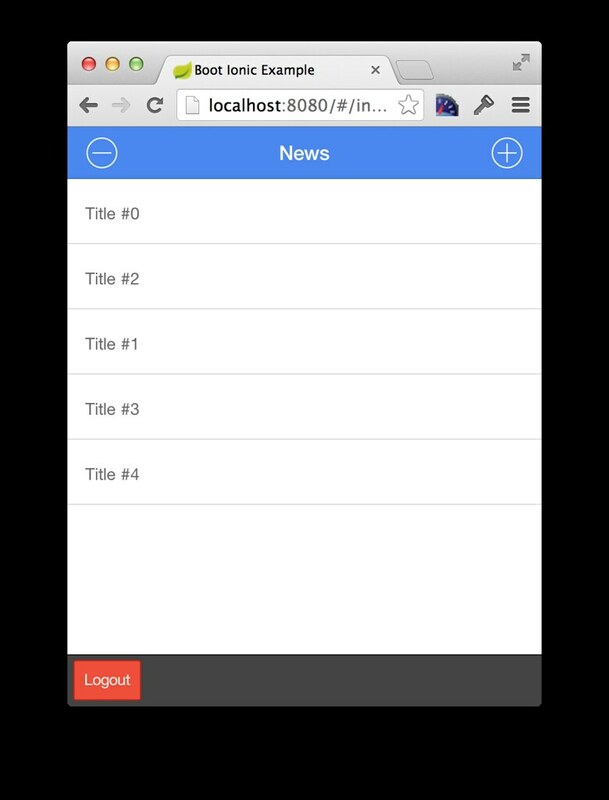 If you're looking to create a native app using HTML5 technologies, I highly recommend you take a look at Ionic. We're glad we did. Angular 2.0 will target mobile apps and Ionic is already making them look pretty damn good. did you take a look at Codename One? You could just do the camera processing stuff in Java with GC for iOS/Android/Windows Phone etc. We have barcode/QR code scanning builtin as well as a ton of other things with a very Swing like API. I'm guessing its a bit late for this project but if you need another mobile app I'm sure we can help you get started. What are your thoughts on Famo.us API? I actually couldn't figure what exactly "@api"
I would appreciate if you can describe what exactly does in that line and what could be solution for my error. Ralph: It's probably easiest if you open an issue on the GitHub project and we can discuss it there. Hello Juan - So far, my only Ionic experience is with iOS. I'd suggest looking at Ionic's documentation or posting a question on Stack Overflow.